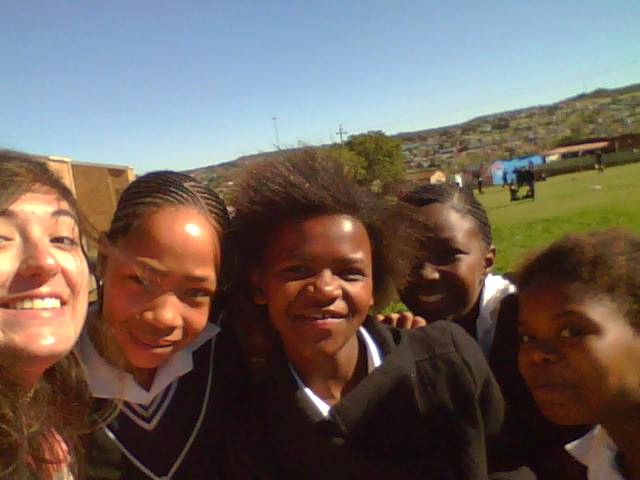 Natalie with her students in South Africa. Photo by Natalie Guajardo. I knew I would love them. My biggest fear going abroad on the Rural and Township Education ICA to South Africa was the inevitable fact that I was going to love the elementary students we would be teaching and that I wouldn’t want to leave them. Before I even stepped onto South African soil, I knew that would be the case, but what I didn’t know was how special the students would be. Now, I’m not saying I had a class full of more than 40 fifth-grade angels. In fact, of the six classes the 12 other Goucher students and I taught, my teaching partner and I probably had the rowdiest. And in three weeks we gave plenty of “you-need-to-listen” speeches and talks with students after class, and we even broke up a fight. Many days I went home exhausted and frustrated. But, at the same time, I had to realize how challenging what we were doing in class really was for them. Just like any other kids their age (or college students for that matter), after hours inside learning, they got a little anxious and ready to do something else. On top of that, they had the added difficulties of learning school subjects in English, their second language, and living in a difficult environment. Some days students mentally checked out because they didn’t understand and they didn’t know how to tell us, some worked so slowly that, no matter how slow we tried to go, they couldn’t keep up, some kids worked through stuffy noses, some showed up to school with ripped clothes and broken shoes and some were so tired they could barely keep their heads up. Despite all of that, most of the time they worked so hard and were so eager to please. It is these moments that stand out now. The students who were struggling, like one boy who stayed after class to finish his work while everyone else went out to play, had more than good reason to have a hard time in school, but they were there and they were trying. And the students who were actually excelling in class were truly exceptional. One thing I loved was seeing them play outside of the classroom, expressing all of their other talents. During their break, a few girls talked and knitted, a skill I could only sit and appreciate. Several kids played jump rope, and, the one day I tried, gave me several chances to get just a few jumps in a row. A big group of boys ran all over a field playing soccer better than I ever will and let me kick a penalty kick for a boy who was fouled; I missed but still got an encouraging high-five. At the end of the three weeks we had a final presentation and celebration. Again, I was awed by all of the other talents they had. Along with the poems and stories we practiced with them for the performance, several of our students surprised us with brilliant dancing, singing and marimba playing. Despite all the difficult times (maybe even all the more because of them) nothing would have kept me from overflowing with pride at how hard they had worked and all they had done in the three weeks we had together. At the end of the presentations, the closing remarks from teachers ran long, and most of our students had to leave to go home. We weren’t able to say goodbye. That was really difficult, but looking back, that might have been for the best. Facing the many hugs and tears might have convinced me to never leave. And now, I have all the more reason to go back.